An alternate theory for the terrestrial ice-age trigger | Watts Up With That? The AGW theory supposes a powerful, pivotal, positive-feedback role for CO2. This is certainly not so. See my previous WUWT postings. Something else drives climate change, and we do not as yet know what that is. It has always been difficult for humanity to throw away one theory before another, more promising one, can take its place. Unpleasant as it is, we are often reduced to the conundrum “How else do you explain it?” And that is the situation just now. However, the case in evidence for pivotal, positive-feedback CO2 is not just terribly weak, but rather non-existent and essentially upside-down. It behooves us to look diligently for the true driver(s) of climate change; and especially major events. Scientists like Hansen and Mann tend to dismiss solar influence. 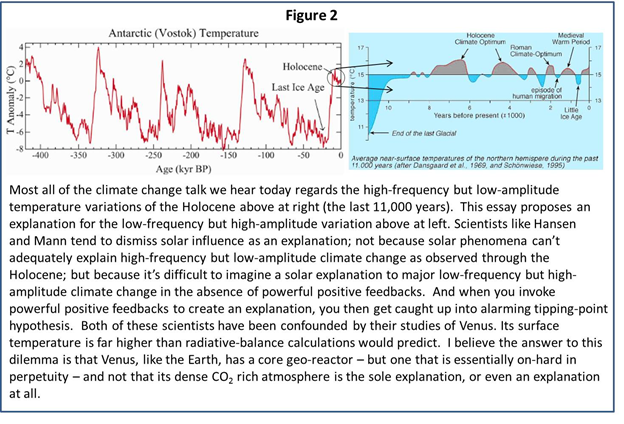 Not because it can’t adequately explain high-frequency but low-amplitude climate change as observed through the Holocene; but rather because it’s difficult to imagine a solar explanation to major climate change in the absence of powerful positive feedbacks. And when you invoke powerful positive feedbacks to create an explanation, you then get caught up into alarming tipping-point hypothesis. I would like to offer a common-sense climate driver hypothesis that possibly you have heard at least parts of before; one that does not invoke powerful positive feedbacks. But then I would like to offer an investigative method that I suspect you haven’t heard before; and one that you may become interested in promoting – the investigation, that is. Call it an easily tested prediction. I’m a career Engineer/Manager and would like to share some simple perspectives on the issue of major climate change. I believe that it is obvious that the prime climate driver is not CO2 and that it is also not the Sun (in spite of solar influence being far greater than CO2). The issue with the Sun as not being the prime driver is, I believe, perfectly understandable at the highest and most salient levels (i.e. not buried in some immense depth-of-detail confusion). The variability of the Sun clearly does have its significant high-frequency but low-amplitude signature on climate (by solar variability, I mean all of its many variants: mean brightness, mean solar distance, sun-spot cycles, coronal discharge events, cosmic ray modulations, etc.). However, the Sun operates on the Earth with huge positive feedbacks. This simple fact all but eliminates it as the prime-driver. When I say prime, I’m talking about the prime-driver-force that accounts for the repeated low-frequency but high-amplitude major transitions to and from major glaciation. When the Earth is glaciated, it becomes highly reflective of solar radiation and, as such, should latch hard and permanently to this cold glacial state; if not for some other powerful driver that repeatedly overwrites this situation. Similarly, when the Earth is interglacial, it becomes highly absorbing of sunlight and so should latch hard and permanently to this warm interglacial state; if not for some other powerful driver that repeatedly overwrites this situation. But we know that both these situations have been repeatedly overwritten. If you go through what is required in order to explain these major transitions, with positive-feedback solar-variation, you get a highly choreographed set of improbable conditions. A set of conditions that requires great solar variability (larger than the Earth albedo change) and critical timing (so as not to ice-ball or scorch the planet) and repeated performance (60-70 known events); such that the Sun is easily dismissed as the prime-driver even as it imprints its high-frequency but low-amplitude signature in many significant ways (CO2, of course, suffers this same dilemma). However, when it comes to low-frequency but high-amplitude climate change, there is a dearth of acceptable scientific explanation. Many are trying to extend the high-frequency but low-amplitude effects of solar and cosmic ray influences into this low-frequency but high-amplitude domain – but with limited to marginal success, at least so far. Yet it appears manifest that these major climate swings are caused by an overriding and truly “pivotal” driver – one whose influence handily overrides the substantial albedo modulations of solar and cosmic ray influences. I submit that there must be another yet far more consequential driver. The question then is: “just what is this immensely powerful, low-frequency but high-amplitude driver that repeatedly overwrites (hammers) these stable solar latching-states to cause abrupt major climatic transitions?” I theorize that the answer is very likely the second most profound source of Earthly energy…the central-core nuclear reactor. See Figure 1. We have known for a long time that the Earth is exothermic and to an extent that would easily cause the primordial interior to go cool long before its 4.5B year’s age. We also know that other planets in our solar system are exothermic; and most likely for the very same reason. It really doesn’t take much leap-of-faith to recognize that there is a huge and very hot nuclear reactor at the center of this currently interglacial Earth. Internal convective motions of the mantel would have thermally homogenized the Earth’s interior save the presence of a centralized heat source. The earth originated as a molten ball that was entirely molten through and through. We strongly believe that heavy elements like iron and nickel gravitationally precipitated to the center. But what about even heavier elements like thorium and uranium? These radioactive materials would have precipitated to the center of the center. And we also know that sufficient quantity of these radioactive elements with, most importantly, sufficient proximity-density, will spontaneously chain react to generate enormous heat. So it seems likely that such a reactor may exist. And this explanation becomes the “Occam’s razor” answer to the question: “just where is it that the enormous amounts of heat energy come from that drive ongoing continental drift, tens of thousands of volcanoes, the circulation of the vast internal mantle and all the Earth’s repeated earthquakes?” This energy is not residual primordial heat and it certainly cannot be explained by solar phenomena. Likely, it comes from a central core nuclear reactor. (There are theories to partially explain these phenomena with distributed radioactive decay. However, a central reactor explanation is a much better overall fit – especially as regards the amount of required energy as well as the sustained enormous thermal gradient of the interior. And strong evidence for a central geo-reactor exists while its size is what is disputed). See Figure 2. But here is the real leap-of-faith (I think not really). We now know that the Sun has complicated internal weather patterns; weather patterns that account for many phenomena we observe. We also know that the Earth has complicated internal weather patterns that account for magnetic-flipping. So how hard can it be to imagine that the center of the core of the Earth might also have internal weather patterns? One can easily theorize a viscous yet swirling pool of fissioning heavy-materials, at the core of the core of the Earth (estimated at >10 kilometers diameter) – accounting for a significant primary-heat to create and sustain an interglacial period (and to drive more rapidly continental drift along with earthquake/volcanic activity). When peaking in rate of reaction kinetics, chaotic pushes and shoves, from fluid flows outside this center, might occasionally disrupt it; so as to scatter the materials into a relatively larger volume with lower proximity-density. And then the rate of reaction kinetics drops significantly (as would the rate of continental drift and the frequency of earthquake/volcanic activity). One can also easily theorize that these chaotic pushes and shoves are the rule, rather than exception (i.e. Chaotic pushes and shoves rule when the reaction kinetics are peaking.) such that the reactor spends most of its life at a reduced output with its fissionable materials relatively scattered – just as the Earth spends most of its time in glaciation (for at least the last million years or so and very possibly very much longer). One can also theorize that over extended time, relative stability slowly materializes from the chaos. Gravitational precipitation slowly re-emerges and the reaction kinetics take off for an enduring yet relatively short period of time – just as the Earth experiences sustained, yet relatively short-lived interglacial warming periods. I submit that this predicted weather variability to the reactor’s rate of reaction kinetics is the prime-driver to major Earth climate changes. The Dutch, until recently, have been trying to finance the building of an anti-neutrino detection facility off the coast of Venezuela for the purposes of beginning to monitor this central-core-reactor and, of course, to simply establish its true presence. However, let’s assume that there is a central core-reactor and that its output variability truly accounts for major climate transitions. There should then be some correlation of the timing of major climatic transitions to volcanic activity though this has not been established in spite of several attempts. But that might be because we’ve looked for the wrong correlation. And as we know, most all volcanic activity takes place under the oceans so this may also be shielding most of the correlation. But what is more, the AGW CO2-biased attempts at establishing a correlation have looked for major volcanic events to precede transitions from glaciation-to-interglacial (so as to then be identifiable as the cause with their attendant large CO2 release). And this has not been borne out in the attempted correlations (ironically, major volcanic events result in short-term cooling with no identifiable ensuing warming in spite of their large CO2 release). However, if central-reactor variability is the real cause, then increased volcanic/earthquake activity might more likely follow transitions from glaciation-to-interglacial. And then reductions in volcanic/earthquake activity might more likely signal the reverse transitions from interglacial-to-glaciation. Maybe this correlation can be established if it is objectively looked for? And indeed, a recent study has shown this volcanic correlation may exist. But here is what I think is the more interesting part – a smoking gun if you will. If this is true, that central reactor variability drives major climate change, then the rate of sub-oceanic crust formation (and the rate of continental drift) should correlate well to major climate transitions; though possibly, or even likely, phase-shifted in time. We have become quite expert at measuring continental drift and its current rates. If these rates can be plotted backward in time far enough to cover several major climate transitions, a high level of correlation may be observed. The reason I’m excited about the possibility of a continental-drift-rate correlation to major climate-transitions is that continental-drift (or the creation of sub-oceanic crust) is a slow and continuous process that leaves “continuous” temporal evidence in the ocean floors (like the ice-cores left essentially “continuous” CO2 concentration and temperature evidence). Volcanic/earthquake activities, on the other hand, are spurious “slip-stick” events that do not leave a continuous trail and so any correlation would be necessarily more difficult to establish. We studied ice-cores at low temporal resolution and came to support erroneous conclusions from our initial analysis (CO2 drives temperature). Then we went back and did a higher temporal resolution analysis which showed a very much more informed result (temperature drives CO2). Your guess is as good as mine to explain why this obvious fact hasn’t already changed our AGW direction (by replacing the “A” with an “N” for Natural Global Warming). But what I’m suggesting is that we do a similar thing with sub-oceanic crust samples to see if the rate of crust growth (or continental drift) does directly correlate to the time-line of major climate swings. This might be a big project; but it could be very worthwhile; the most worthwhile I can think of. It fits well into the “smoking gun” category. For all I know, a reassessment of the currently taken oceanic crust samples would reveal the correlation; in which case the project scope might be fairly small. However, a higher temporal analysis may be required (not so likely) and that might significantly complicate the size and scope of the project. See Figure 3. Somehow we have managed to convince ourselves to be looking for a subtle, nuanced needle-in-a-haystack (large variation from tiny perturbation). What we should be looking for is a hammer in an otherwise empty drawer (a significant perturbation). There is nothing subtle about these major climate-transitions. They’re very abrupt and severe (even more so than our “smoothed” back casting Is able to reveal). It is manifest that whatever causes them, it overwrites all other considerations (including solar-induced stable latching states). Yet many of us remain convinced we are sinners who must punish ourselves for nuanced CO2 emissions. This is inconsistent with both the evidence and any common sense evaluation of it. We are not sinners. We are the good custodians of this Earth (as we respond to our misdeeds geologically instantaneously). In fact, we are the “nature” of this Earth. Can you imagine visiting aliens coming to a different conclusion? And enhanced atmospheric CO2 stimulates the proliferation of all forms of life. Inevitably this Earth will fall to the next glaciation and that is what we must begin to prepare for. It appears manifest that these major climate swings are caused by an overriding and truly “pivotal” driver – one whose influence handily overrides the substantial albedo modulations of solar and cosmic ray influences. I submit that there must be another yet far more consequential driver whose investigation warrants exceptional attention. This essay attempts to point the science community toward a possible explanation of major, low-frequency but high-amplitude climate change. Admittedly, this essay contains many raw speculations regarding a central core geo-reactor’s potential weather variability. However, science is about testing testable hypothesis. I submit that I’ve laid out a plausible hypothesis that attempts to explain many broad observations – and one that is indeed quite testable. I’ve also made several supporting predictions that are, themselves, individually testable (see a link at the end for the full essay with detailed predictions). At the highest and most salient levels, this hypothesis rings true over extended time and right through to the very present. Any attempt to confine the scope of major climate change drivers to CO2 or solar phenomena (or both) is bound to run afoul of “first principles”. There simply is no climate “hammer” to be found in these areas. Without a “hammer” we become compelled to search for powerful positive feedback amplifiers to explain major change driven by small perturbations. But such amplifiers always and intrinsically lead to an unstable and precarious system (and therefore, most likely don’t exist). The Earth is some 4.5B years old. And we know that the climate has been remarkably stable (in spite of what we consider to be major climate change) for the last 3.5B or so of those years (~+/-6-10OC). It simply cannot be so that extraordinary interventions allowed a steady stream of calamities to be dodged, each and every time, throughout these last 3.5B years, such that no positive-feedback runaway event could occur. Somewhere there must be a “hammer” – a powerful and overriding, yet limited in extent, driver that comes and goes without feedbacks, positive or negative. Otherwise we would not be here to debate this issue. The intrinsic instability of a system where small perturbations are amplified by powerful positive feedbacks is a system that will soon experience a runaway condition. And in the case of this Earth, it would have happened long ago. An examination of the ice core data reveals that this hypothetical climate “hammer” is able to move the nominally equilibrated mean temperature of the Earth by as much as 10-12OC as its modulating effect comes in and out of play. I propose that this temperature modulation arises from a core geo-reactor that takes on two primary states. In one state, its fissionable materials are relatively scattered such that the reactor kinetics are characterized by little chain-reaction. It is in this state that the Earth experiences major glaciation. In the other state, the core geo-reactor’s fissionable materials are highly proximate and appropriately moderated such that the reactor kinetics is characterized by a great deal of chain-reaction. It is in this state that the Earth experiences the warming of an interglacial period. I further propose that the impetus for generating these recent, sparsely spaced, shorter periods of high activity has become synchronized to the celestial mechanics of the 100k year Milankovitch Cycle of orbital eccentricity (for the last 1My or so). And while the classic interpretation of Milankovitch Theory has been confounded in that it expects glacial events to fall on eccentricity maxima, when empirical data show them falling on eccentricity minima the proposal herein resolves this matter. According to the proposal herein, eccentricity maxima incite high geo-reactor kinetics for a limited period of time (an interglacial), leaving the longer glacial period to exist during eccentricity minima. Further, during the 4My prior to the last 1My, I propose that the intermediate fuel availability of this period allowed the synchronization to be paced by the smaller, more rapid celestial perturbations of obliquity and/or precession. If the foregoing statements are true, there should be a significant correlation to be discerned between rates of tectonic activity and large scale Earth temperature swings. In order to determine rates of tectonic activity over time it is required to accurately date sub-ocean crust samples. However, the current state-of-the-art regarding oceanic crust sample dating is very limited. Least count time resolution of this type of sample dating has, until recently, been limited to a few million years leaving no opportunity to observe a tectonic activity rate relationship to the 100ky orbital eccentricity cycle. Recent work at the Univ. of Wyoming has provided an improved, albeit laborious and expensive, dating technology for sub-oceanic crust samples. The new technique yields a least count time resolution of ~10ky which should be readily capable to resolve the proposed relationship. In the event that the proposed relationship can be definitively established, I further propose that this would constitute substantial and compelling evidence of major climate change being primarily driven by geo-reactor energy output variability. Only a very short time ago we considered solar activity to be substantially invariant. We now know otherwise. It may well be so that the core geo-reactor is similarly highly variant, but yet more consequentially so; and currently synchronized to orbital eccentricity. Ronald D Voisin is a retired engineer. He spent 27 years in the Semiconductor Lithography Equipment industry mostly in California’s Silicon Valley. Since retiring in 2007, he has made a hobby of studying climate change. Ron received a BSEE degree from the Univ. of Michigan – Ann Arbor in 1978 and has held various management positions at both established semiconductor equipment companies and start-ups he helped initiate. Ron has authored/co-authored 55 patent applications, 24 of which have issued. April 24, 2014 in Earth. My concern with this theory is the thinness of the Earth’s crust. If you had a geothermal heat surge sufficient to melt surface ice, wouldn’t such a heat outflow through poorly conducting rock also melt the base of the Earth’s crust? To get an idea of what a poor heat conductor solid rock is, consider the use of boreholes to research historical temperature. – you can determine the surface temperature, several centuries ago, by drilling a hole and taking measurements. Ronald, you have omitted from your discussion of this interesting theory, the mid Pleistocene revolution (MPR). As you correctly say, interglacials have been spaced about 100,000 for the last million years or so. However for 2 million years immediately prior to this, the interglacial spacing was shorter, 40,000 years. The conventional view is that pre-MPR the glacial cycle was paced by the obliquity Milankovich cycle (41,000 years) and that, at the MPR this changed to pacing by the eccentricity cycle (100,000 years). Interestingly they suggest a role for an additional, internal unforced oscillation of about 100,000 years, although they ascribe this speculatively to a cycle in carbon weathering. It is thus possible that, should an internal fission reactor exist with a 100,000 year cycle, it could take the place of the carbon cycle 100,000 year oscillation in the proposed scheme in the above paper. locked into the paradigm of CO2 forcing temperatures. All their mechanistic suggestions concerning a forcing role of CO2 on temperature are equally valid in the exactly reversed paradigm – temperatures forcing CO2, and their failure to see or acknowledge this is surprising. Even the CO2 feedback that they propose could just as easily be albedo feedback. All that they dare admit is that the reasons for changes in CO2 level are poorly understood. I have no idea if Mr. Voisin is right or wrong, but more power to his elbow for putting his idea forward for discussion. If only some of the other so-called “climate scientists” would do the same. Right on! Support for the theory of a core georeactor can be found from J. Marvin Herndon (http://nuclearplanet.com/Herndon%27s%20Nuclear%20Georeactor.html). The periodicity can also be explained by the gradual accumulaton of fission poisons, reactor shutdown, and gradual radioactive decay of the poisons, with reactor restart. Natural reactors were discovered in Africa, modulated by the water saturation of rock that had high uranium concentrations. If I recall correctly, Herndon associates the reactor periodicity with inversion of the terrestrial magnetic field (due to start-stop of convective circulation dynamics), so it might be a first exercise to match magnetic field inversions against the glacial record. This is the craziest idea I have seen advanced since continental drift. 😉 Well-written, too, BTW. b.: Using the phrase “slow and continuous” brings echoes of Hutton’s concept of uniformitarianism versus that of catastrophism. You might enjoy reading this part of the history of science. Related material about the Deccan Traps and the Columbia River Basalts might be informative. Yes Earth crust is thin, but not same figures everywhere and please rememember that if you take a rope representing Earth radius where every 10 km is represented by 1 cm on rope – draw a circle with that rope – it’s a hugh circle but only one cm above line and one cm under is the small part of it all we humans have knowledge enough to do any kind of reliable calculations about – the rest we asume from meassuring different things – but know for sure we don’t. Thus the hypothesis is interesting but it seems to be lacking factors needed. Geomagnetic excursions are short-lived periods of time during which the direction and intensity of the Earth’s magnetic field deviates from that normally observed during secular variation. Approximately 7 excursions of the Earth’s magnetic field have occurred since the last full geomagnetic reversal at 780 ka, although the absolute chronology of these is uncertain. Excursions are typically accompanied by a drop in the intensity of the field, and these fluctuations are also reflected in global records of cosmogenic radionuclide production rates from deep-sea sediments. It has recently been shown that the drop in intensity of the Earth’s field is essentially synchronous with the increase in the production rate of beryllium-10, and this suggests that it may be possible to correlate climate records from marine cores with those in terrestrial records such as ice cores. Certainly, plate tectonics, i.e., the position and configuration of the continents, influences the severity of glacial epochs within ice ages because of the affect on ocean circulation. However, “continental drift” is a slow process and cannot account for the geologically rapid and repeated transitions from glacial to interglacial conditions within our current ice age. It also cannot account for the change in cycles within the current ice age which started out at about 41,000 years and are now at about 100,000 years. Milankovitch cycles can account for the change in cycles. By the way, heat may be generated within the Earth by mechanical energy due to tidal forces of the Sun and other planets. I see you quoted ‘becomes the “Occam’s razor” answer to the question:’, in my opinion you didn’t have to go any further! Not with 500 million years of evidence that co2 and global temperature are linked! OK there are other influences, such as continental drift, the Milanovitch cycles and other orbital influences but they are well known and fit in with the overall climate change theory of co2 being the main forcing agent, whilst everything else remains stable. Willis, we have exothermic data I presume. This would tell us something. You are a show me the data type of guy. If the earth’s exothermic record is variable and not a declining curve – I’d say the theory has at least one leg to stand on. I’m taking somebody’s word for it. How do we know the earth is exothermic? What does that data tell us? This is pretty much easy for any petroleum geologist to crush with data. Thermal history of the earth is recorded in the rocks via vitrinite reflectance and other geothermomerty methods. The swings of ~ 10 ° C in figure 1 would have been recorded in Pliocene & Pleistocene sediments – and to my knowledge , nothing like this has been seen anywhere in the rock record. Additionally, this model wouldn’t explain why similar temperature swings have not been seen through out geologic history. The idea that superplumes influence climate has been around for decades, but perhaps not in exactly this formulation. The Permian & Triassic extinction events have also been attributed to superplume activity. Please see interesting behavior of the stratosphere. Although the temperature of the stratosphere over the poles decreases, there has been an increase in pressure over the South Pole and lows moving north. Please also see jumps of cosmic rays (solar activity). What’s wrong with this theory? Let me count the reasons……………. 1. The biggest problem with this (and other) proposed climate change mechanism is the climate changes occur abruptly, especially at the end of an ice age, the rates of temperature change are high over short periods of time, and can repeatedly switch on and off very quickly. 2. This means than various planetary (or orbital) hypotheses don’t work, including Milankovitch (aka Croll). They invariably require slow changes over prolonged periods of time that don’t fit the geologic record of climate change. 3. Milankovitch and some other orbital or planetary schemes (including this one) require that the Northern and Southern Hemispheres be out of phase with one another. We now know that glaciations occur simultaneously in both hemispheres, so that is yet another strike against the Milankovitch (Croll) theory. 4. Throughout most of the Earth’s geologic history, climates have been considerably warmer than the past several million years. The Pleistocene ice ages didn’t appear until about 2.5 million years ago and have sputtered on and off since then at rates much faster than core-related phenomena could account for. 5. There is no data to support this theory. As someone above mentioned, this theory has a major problem in that the amount of energy available seems much, much too small to have the right magnitude of effect you are hoping to explain. From my POV, there are most likely a fair number of factors involved in the shifts you are talking about but one deserves special mention here: the fact that sensitivity is not a constant as most of these discussions involve IMO. As the snow cover gets [closer] and closer to the equator, it takes less and less energy to make a big climactic effect. Melting a square meter of snow on the equator will cause a much bigger change in the sunlight absorbed by the Earth than a square meter of snow melted on the Arctic circle. Obviously, this needs to function in conjunction with other factors but this effect (if it exists) does make climactic shifts more likely. Impossible. The idea falls flat on it’s face when you consider that every time temperature has risen and CO2 has risen along with it – temperature then magically begins to go back down again while CO2 concentration persists at a higher amount until temperature has significantly dropped. Anyone who looks at that fact from a systems viewpoint would be very tempted to declare CO2 as a negative feedback to temperature and CO2 concentration thoroughly driven by and dependent upon temperature. The evidence for latter is obvious and happening right now – warmer oceans emit more CO2 and warmer living conditions generate more life respiration emitting more CO2. Highly interesting. But I would rather see it as just one of the components of the climate engine, including solar, fluids, gasses, cosmological, etc., etcetera. And at that point the equations grow so huge that it’s no wonder we can’t make a model that begins to make sense! I’m not so dismissive of the Sun especially during the inter-glacial periods. The solar wind must push the atmospheric envelope about depending it’s strength. What effect would this have on positions the jet-streams? Here is a visualization of how viscous coupling between an irregular shaped core and an irregular shaped mantle can interact. The video demonstrates the exaggerated radial motion created by a very small amount of relative rotational motion. The green coupling would be the molten material below the Earth’s crust (green) and the irregular shaped core (blue). If the oceans’ waters circulate deep into the earth and back out again more voluminously than is now accepted, that could be a heat transport mechanism. If something were to speed up and slow down the rate of circulation, that could account for climate variation. The spike in the Younger Dryas might fit in with such a phenomenon being able to rapidly turn on and off. Dusting off knowledge from upper division courses in heat flow. IIRC, the source of outbound heat flow is indeed surmised to be decaying radioactive materials. It is true that mass attraction would tend to concentrate them at / near the core. However there are also distributed instances throughout the core, mantel and crust. It is a distributed heat source, with greatest energy density at / near the core. In essence the reactor has no walls and no coolant per se, cooling is via the conduction and convection of overall matrix of material in which the radioactive substances reside. Looking at recent ice-ages and interglacials is an excellent antidote to global warming doom. There are clearly 2 stable states of the current Earth, one icy and one warm. The fact that we have returned several times to today’s warmth is hugely reassuring, as is the fact that the Earth spends more time icy than warm. The latter fact suggests that a bit more warmth is likely to be beneficial, with the balance tilting in the right direction, towards more time warm, less time icy. Good news for all except polar bears, and for those who wish to exploit them for political purposes. Note the asymmetric nature of the ice ages: slow buildup and rapid decrease. He calculated that the icecaps of scandinavia and north america slid southwards under their own weight and then rapidly melted. The subsided land lifted up again to end up high enough for new ice. So a purely mechanical mechanism. ref: J. Oerlemans (1980) Some model studies on the ice age problem. Greenland and Antarctica escaped this cycle because their ice calves continuously over the edge in the sea . I fully support the concept of a fission core at the center of the Earth, operating at the balance of criticality, with feedbacks from reactor poison accumulation and decay (Michael J. Dunn 9:05 am)and thermal expansion of a reactive core on the scale of a hundred kilometers. It might be episodic with heat pulses, generation of poisons, thermal expansion and throttling. I must discount the notion of gravity separation in the core. The acceleration due to gravity on the surface of a sphere of uniform density is proportional to its radius. (mass increases by r^3, attraction decreases by r^-2). Therefore, the gravitational acceleration on the surface of a 60 km radius core is only 0.01g. (maybe 0.03 g if we increase the density to 8). Therefore, I propose a CHEMICAL, Crystallographic, mechanism for separation and concentration of fissionable materials. Gravitational forces at the core are small, but the pressures are huge and the pressure-temperature environment is beyond our ability to experiment except theoretically. Poisons don’t “bubble” or float out of the core, but are ejected out of high-temperature, high-pressure metastable crystal lattices. As interesting as the physics of nuclear reactions in the core are to contemplate, the chemistry and metallurgy of the core environment are fantastic. As for the neutrino detector… One wonders why we have not detected an unknown surplus of neutrinos when we account for the sun (and we have worried about a deficit of neutrinos for decades) and their generation from controlled fission reactor cores. While the nuclear physics and chemistry of the core are worth study, what matters here is what effect could they have on periodic ice-ages. This is where the theory falls down, I think. In Oil and Gas exploration, part of the geologic science is Basin Analysis and Geohistory. Suffice it to say, it is based upon models and many assumptions. Some of those assumptions are sediment flow, ages of deformation, depth of burial. A key assumption is geothermal gradient and a key control is the vitrinite reflectance (a measure of their temperature-time “cooking” maturity) of source rocks from the kitchen and other strata. The Basin Modelers will vary the geothermal gradient to help match the observed maturity, but they ususally constrain that by the tectonic environment of rifting events, craton position, etc. Changes to geothermal gradient are pretty gradual, long term, and NOT periodic. Could it be that the Geohistory modelers have got it all wrong? That the core every 100,000 years switches into high gear enough to raise the geothermal gradient world-wide enough to measurably affect the melting of the great ice sheets or to allow for accumulation of ice sheets? No. I do not see how the Geohistory modelers could be that wrong. For heat flow to increase enough to matter to ice sheets, geothermal gradients would have to increase enough to overcook the source rocks for trillions of barrels of oil. We would have known something didn’t add up back in the 1970s or 1980s. Abstract. We present a revised estimate of Earth’s surface heat flux that is based upon a heat flow data-set with 38 347 measurements, which is 55% more than used in previous estimates. Our methodology, like others, accounts for hydrothermal circulation in young oceanic crust by utilising a half-space cooling approximation. For the rest of Earth’s surface, we estimate the average heat flow for different geologic domains as defined by global digital geology maps; and then produce the global estimate by multiplying it by the total global area of that geologic domain. The averaging is done on a polygon set which results from an intersection of a 1 degree equal area grid with the original geology polygons; this minimises the adverse influence of clustering. These operations and estimates are derived accurately using methodologies from Geographical Information Science. We consider the virtually un-sampled Antarctica separately and also make a small correction for hot-spots in young oceanic lithosphere. A range of analyses is presented. These, combined with statistical estimates of the error, provide a measure of robustness. Our final preferred estimate is 47 ± 2 TW, which is greater than previous estimates. A heat flow of 47±2 TW (terawatts, 1012 watts) divided by 5.11E+14 square metres of earth surface gives an average of 0.09 ± 0.004 W/m2 … about a tenth of a watt per square metre. I’m sorry, but no matter what slow variations there might be in that number, a geothermal forcing of a tenth of a watt per square metre doesn’t explain anything about the climate, including the ice ages. And whether the warming is from a nuclear reaction or not, even if the geothermal heat flux went to zero, the effect on the climate of the loss of the tenth of a watt/m2 would be undetectable. Some think there are three states: warm, as now; cold, as most of the time, & very cold, as during the Last Glacial Maximum & possibly Heinrich Events, when armadas of icebergs set sail on the North Atlantic. Not that I have any expert knowledge of nuclear physics, but wouldn’t a concentration of Uranium, etc, sufficient to sustain a chain reaction burn out far too quickly for this mechanism still to be working after a few billion years? A chain reaction vastly accelerates the rate of radioactive decay compared with ‘normal’ radioactivity. The amount of energy released in the long term is the same, but it is released over a period of decades (in the case of a reactor) or instantaneously (in the case of a bomb), instead of millions or billions of years. It seems reasonable to propose variations in the earth’s central core could convect heat to the surface in a semi-periodic way. But you would need to start with the big convecting systems such as the mid-Atlantic ridge or continental margins and plate boundaries or hot spots (e.g. Hawaii). These systems take millions to hundreds of millions of years to cycle. I can’t see the earth warming up and cooling down by convection through the crust. Just not enough heat and the change couldn’t be abrupt due to thermal inertia. I could see such a heating system warming up the oceans and the oceans warming up the atmosphere. But again I can’t see this system jumping from warm to cold and staying stable unless the source was near the mantle-crust interface and not the core. If the source was closer to surface it would have a greater chance of causing an abrupt change. Gee, Blackadder the 4th spewing nonsense… no real surprise there I guess. I have yet to see any evidence whatsoever that CO2 acts as a “main control knob” on anything whatsoever, especially the climate. Main Driver – not a chance. – Amplification is required more than the minor direct solar flux variations, not problematic “feedback”. Solar wind modulation of cosmic rays / cloud formation is plausible. – Neglect of latitude variations on albedo impact. Apparently following the erroneous idea that a uniform high albedo cools a planet. – Neglects radioisotope decay impact on reactor activity. – Neglects thermal mass of core and mantle. Glad to see discussion on this as have been wondering and reading about heat flow from the earth’s mantle for years, especially after spending some time underground in mines and doing ground heat studies in northern Canada. It has intrigued me for years. I had read some of the referenced material posted but some of the explanations and comments from the posters have helped a great deal with understanding them. From one old retried engineer to one who is still working (I presume), thanks for the post. A lot of questions were answered for me. And others were raised that will take further thought. Thanks again. This was a very good discussion. A provocative conjecture that will stimulate a lot of thought. My immediate question is: if we’re looking for a hammer, how does Shaviv’s spiral arms hypothesis look? My different thoughts. The mass of the Earth changes? Pressure releases change ocean cycles? So, the Indonesian quake in 1996 caused an El Nino in 98? Hope we don’t get hit by a big rock that sends mass scattering away from us, we’ll freeze. I would have to agree AND disagree with that statement. The heat flow itself to the surface as contribution to climate warmth is negligible, BUT the heat flow crucially drives other vital geo-physical processes that make Earth unique among the 4 inner planets of the solar system. These processes do have major impacts on Earth’s climate control set-points in the near-term (vulcanism driven by hot mantle plumes themsleves driven by deeper heat flows), long term (outer core dynamo-magnetic field generation), and very long term (tectonic plate rifting and mountain building, and ancient Traps – Deccan, Siberian, etc). ‘Impossible. The idea falls flat on it’s face when you consider that every time temperature has risen and CO2 has risen along with it’. not quite! Because there is evidence that there was a 800 year lag before co2 caught up with temperatures at the end of the last ice age! (In fact this is often used by AGW doubters in an attempt to wrongly deny the properties of co2. And similar lags have been recorded at other terminations of ice ages. The reason for the temperature rise and the co2 800 year lag. This is the main forcing agent, until the warmed up Earth released co2, from the sinks, such as the tundra and out gassing from the oceans reaches SUCH A LEVEL IT TAKES OVER, about 800 years later and becomes the forcing agent! As is explained in the link! Please feel free to highlight any errors you think maybe in the link! Solar variations modulating cosmic rays combined with asteroid impacts could further impact climate via varying cloud cover. In you guest post you mentioned the reversing of the Earth’s bipolar magnetic field. Did you locate any time series proxy databases of the record of such reversals? Other commenters => same question, have you seen any such time series proxy databases of the record of such reversals? Thanks for the link. I’d never heard of that. The solar insolation at high latitudes data are pretty compelling. CO2 has nothing to do with this. Surface heat flux from the planet’s interior is 0.087 watts/square meter compared with the ~239 watts/square meter from the sun. Its hard to see how even major anomalies in the heat flux from the interior could have much effect on surface temperatures. However, anomalies in the mantle and below might cause extensive volcanism and plate movements as the author suggests. This might well spread enough volcanic ash around to counter the albedo effects from glaciation and end an ice age. My feeling is that the ice ages start with Milankovic cycles, progress with albedo related feedbacks, and end with episodes of volcanism that first accentuate the cooling but later destroy the albedo effect. Such episodes would not be something to look forward to. For the planet Venus it’s more realistic. The high density of the atmosphere and it’s temperature distribution ressemblence a solar pond. The source of the built up of the surface temperature must be the internal heat of the planet. The real cause of Ice Ages ? – Resonant dust clouds ? You can see already that ozone is not uniformly distributed over the southern polar circle. This results in inhibition of the polar vortex. Shows this also declining index AAO. In 2013 he was also negative during the winter. I do not agree. There is a warming rebound , at least in the tropics after a major volcano (and it’s nothing to do with feeble – globally speaking – amount of CO2 that comes out). Could an episodic fission core manifest itself on the surface some other way than geothermal gradient? Hypothesis: A tiny thermal expansion via a fission pulse that expands the core and mantle by a factor of 1.0001 and therefore mechanically aid mid-ocean rifting (and subduction during cooling). by stretching and shrinking the earth’s radius by a 1 km in 10000 km at the crust over a 100,000 year cycle? It might happen, and it might show up in volcanic episodes. But it would be tough to measure and tougher to prove cause and effect. I like the “ratchet” effect this mechanism has on plate tectonics. Many people believe the viscosity of the mantle is higher (by a couple orders of magnitude) to permit convection to be the driver of plate tectonics. I personally prefer the unballanced overturning conveyor belt theory I heard from John Dewey and Sengor. For a brief period (1956-1959), an Expanding Earth hypothesis (Bruce Heezen) was thought to be a workable answer to mid-ocean rifting. Then along came Henry Hess and Paul Dietz about 1959-1962 with the concept of subduction which eliminated the need for an expanding earth to accommodate mid ocean rifts. This discussion of an episodic nuclear core has brought to my mind a plausible mechanical driver to plate tectonics. A rachet. A subtle expanding and contracting heartbeat of the Earth. Heezen might have been half right: rifting is associated with an expanding Earth phase, but an equal amount of subduction is associated with a contracting phase. Accelerated Rifting during a 1 part in 10000 expansion over 50,000 years, accelerated subduction during a 1 part in 10000 contraction over another 50,000 years. . Since volcanism is associated with both processes, I’m not at all sure a cause and effect signal could be detected unless you can show rifting vulcanism to be significantly out of phase with subduction vulcanism. Over a decade, you would need to measure changes in the radius of the earth to a precision of 1 part in 50 million or 0.1 meter in 5,000 km. I think we can measure that. So it would be interesting to know the upper limit on the possible change in the earth radius over the past 20 years of satellite history and GPS measurements. That may be the case all being well in that particular field of science. However, climatology largely stopped doing what can seriously be called science at around that time ( circa 1990). What has happenned since has been a wasted generation. Normal functioning of the scientific process and your suggested rule of thumb, have been out to lunch ever since. You must have bought into Mufti Gore’s “Inconvenient Truth” hockey schtick fantasy hook, line and sinker. He used nice cartoon animations too. Did you see “2012” – The movie? In case you didn’t realize it, the Earth as we knew it, was destroyed. (At least in Hollywood animations). We all died in 2012. If you don’t believe me, check it out yourself. I thank Ronald Voisin for setting up a thought experiment which pushes against the current context / bounds of our knowledge. Consider: If it assumed (even allowing that it is a highly untenable speculative assumption) that we really need an unknown physical phenomena outside of known physical phenomena to explain glaciation cycles in the near and far geological past, then there is no reason to limit the unknown physical phenomena to the fundamental principles in science attributed to the current known universe. That is to say, we would not be reasonably limited in seeking an un-conceived / undiscovered kind of fundamentally difference principle based physical phenomena ‘X’ which we might subsequently identify through clues from unanswered questions on climate behavior. Re: Grant funding to identify ‘X’: => I only take private grant funding (no public funding allowed). It is an interesting idea. I had a look at Herndon and his papers basically reference his papers, his website is a vessel of Herndon love and he has numerous different theories for things that compete with accepted wisdom, all that he refers to as the Truth with a capital T. I would skip this without any solid data supporting it. WRT the author’s comments on positive feedbacks. Any system that exists for a long period is necessarily bounded by negative feedbacks even if it has +ve f/b also present. The glacial/interglacial bistable can be regarded as an op-amp with a bit of +ve f/b. Once the differential input goes either positive or negative there is a ‘tipping point’ and the +ve f/b runs the output near as near the supply rail as it can get. And that is the bounding -ve f/b. the op-amp cannot indefinitely ramp in either direction, it just latches up to one rail or the other. It then requires the input to come back by half the output swing for it to latch in the other direction. This doesn’t have to be a “hammer” it can wander around all it likes and the the output remains latched until the meander passes half the output range, and bang!, it flips to the other stable state. In the climate case the bounding -ve f/b is probably the Plank feedback. Albedo is likely one of the key +ve feedbacks, (along with life itself bursting into action or freezing out). None of this contradicts the nuclear core idea but it does not have to be a catastrophic ‘hammer’ blow as the author seems to suggest. For similar reasons any other suggested cause would have to be strong enough to push create half the glacial/interglacial swing before internal +ve f/b can be invoked to help it. In that respect the author is correct, but it does not have to be a hammer blow. To further emphasize Willis’ comment / calculation of current heat flow of 0.09 W/m^2, consider also that we are in a warm period , so if we go into a cold period, even if terrestrial heat flow dropped to zero, we only loose 0.09 W/m^2 …. And that is not going to result in a mean temp drop of ~ 10 deg C shown in figure 1. Sorry, the most interesting is that the ice in Antarctica will be a record. I am a life long Engineer, who has worked some of this nation’s largest and most ambitious projects. And due to my work for NASA, I have been able to maintain and expand my scientific understanding of the universe. site where the Fishhook Mammoth was found is situated at about 200 km north of the present timber line.” especially since the dating was close to the last glacial maximum, when the earth was supposed to be deep freeze. Another such a failed hypothesis is that the waxing and waning isotope ratios in oceanic benthic foraminifera core records represent total oceanic water volume and consequently also the total waxing and waning ice sheet volume. However if you do the math for the last glacial maximum it turns out that there was only half as much extra ice sheet volume as there should have been. So if your tools are bent, there is no way to find the Earth theory of everthing. Nevertheless, this is a beginning. The scientific method …make a guess, as is done here and then do predictions what to expect when the guess was right. Thats going to be very tough. Andy: ScienceofDoom has a long series of posts (Ghosts of Climate Past) that conclude none of the theories based on Milankovitch cycles provide a completely satisfying explanation of glacial and interglacials and that most experts recognize the existence of a substantial problems. Like CAGW, when one examines the details of the “settled science” of ice ages, one discovers difficulties. On the idea that rates of tectonic activity should be correlated to climate, this is also easily falsified through the geologic record. The earth’s average radius is basically constant, so if there is increased spreading rates associated with periodic changes in the core as proposed then there also has to be corresponding rates in subduction to keep the radius constant. And with subduction comes andisitic dominated volcanic activity which generates wide spread ash deposits which are easily age dated through radioactive decay methods. If this theory were right we would observe cyclic & semi-synchronous ash deposits throughout the world, with periodicity tied to climate cycle periodicity. To my knowledge , this has never been observed in the data. Given geo-history / age dating is a huge area of geologic research, if this relationship were present , researchers would have certainly seen it by now & at least contemplated what it means, however this is not the case. I do not know enough physics to critique the theory. Others are doing that. But the idea of plate tectonics bears study. That would at least explain the major changes, if not the minor ones. But the minor ones may be just enough sun and ocean currents to explain the 100k years on, and 20k years off. At the very least, it bears investigation. One argument against fissionable elements in the earth core is that long living fissionable elements like uranium are siderophile and have migrated to the crust and mantle in the early stage of the history of the earth (i.e. The first billion years) when iron and silicium were separated in the natural furnace process that created the iron-nickle enriched core. So which fissionable element is postulated in the current earth core? Too much time wasted criticizing CO2 theory, not enough building this thesis. Stripping out all references refuting CO2 plus removing rhetorical and philosophic language it’s only a few paragraphs. Rewrite it as if it were a standalone idea. Seriously, I am confident that the earth’s magnetic field has a profound effect in many realms that we are only beginning to understand. The world far beneath the surface of the earth is the source of this field and we can only speculate on exactly what sort of “weather” is going on down there regarding extreme temperature, pressure, circulations and structural composition. The theory of a central core nuclear reactor is a hard one to embrace though and evidence does not support it. However, I think science has a lot to learn about the effects of our changing magnetic field. Often, learning is more difficult if one doesn’t at least allow for the plausibility of explanations that are different than what is currently understood. You are on the wrong page. The heat released by radioactive decay in the core of the planet is orders of magnitude too small to explain the ice epochs. The ice epochs are caused by changes in galactic cosmic rays (GCR intensity increases by a factor of 5 to 7 times) that occur when the solar system passing through the galactic plane. The changes in GCR modulate planetary cloud cover. (Note there is currently a very large change in the solar magnetic cycle that is inhibiting the GCR mechanism as the solar magnetic cycle shuts down.) The end of the inhibiting of the GCR cloud modulation mechanism is regional different on the surface of the planet as the time delay for the charge unbalance (see next comment for an explanation as to what could cause a charge unbalance about the sun which in turn with some delay causes a change in charge about the planets, the mechanism explains why the large gas planets Uranus and Neptune have magnetic fields are roughly at 90 degrees to the planet’s rotational axis and that are offset from the axis of the planet.) is different depending whether there is ocean or continental crust in the region and question. There is now evidence of significant sudden cooling in the Southern Ocean which explains the sudden increase sea ice. The Arctic cooling will follow. The glacial/interglacial cycle and cyclic abrupt climate change is caused by the restart of the solar magnetic cycle that can cause (whether it does or does not depends on the orientation of the earth and whether there are insulating ice sheets on the surface of the earth and on the specific locations of the ice sheets and the continents at the time of the solar magnetic restart. ), a geomagnetic excursion. (In the last 15 years the geomagnetic field specialists have found the geomagnetic field anomalously and cyclically abruptly changes. The geomagnetic field changes cannot be caused by core changes as there is no core mechanism that can change rapidly enough to cause the observed geomagnetic field changes and there are induced electrical currents in the core when there is any change in the field that resist fast changes, so if the change is forced from the core the speed of the change is limited to thousands of years. The observed changes to the field are occurring in days and months which absolutely rules out core forcing. Observational evidence of the massive charge release from the ionosphere to the surface of the planet when the solar magnetic cycle restarts, are the burn marks throughout the Northern hemisphere that correlate with Younger Dryas abrupt climate change event. (The planet cooled for 1200 years, as the imposed external field change is resisted by the internal core field and then gradually the core field changes and increases in strength. When the geomagnetic field increases in strength and returns to a polar field GCR is again deflected and the planet warms. Whether the solar magnetic cycle strengths or decreases the geomagnetic field when the initial strike is integrated by the geomagnetic field is dependent on the orbital orientation at the time of solar magnetic cycle restart. The earth is currently in the orientation to terminate a interglacial period. The fundamental model of happens when very large astronomical objects collapse is incorrect. Matter resists the collapse by forming charge pairs. The resulting massive collapsed astronomical object is active, produces massive magnetic fields (quasars), and is not balanced in charge. The sun is formed from the core of a super nova. This phenomena explains a host of astronomical anomalies such as the spiral galaxy rotational anomaly, the quasar massive jets, quasar ejected objects, the massive magnetic fields associated with quasars, and so on. A couple of astronomical papers that provide observational evidence and theory to support the assertion that large collapsing objects resist the collapse by forming an active object that changes and evolves with time, rather than a ‘black hole’. The papers I am quoting next note that geomagnetic excursions and bi-hemispheric volcanic eruptions correlate with abrupt climate change but the authors do not understand the mechanism. The massive electrical discharge causes the geomagnetic excursion and also caused the bi-hemisphere volcanic eruptions. I’ve read Herndon’s book. It is very solid. Herndon has run his theory through simulations used at the national nuclear labs. Yeah, he’s a bit proud, but what difference does that make to whether his ideas hold water? Most everyone seems to be jumping on the assumption that a core georeactor could only influence the climate through adding to the effective insolation. Keep in mind that the absolute temperature of the Earth is proportional to the fourth root of the ratio of albedo to emissivity. A 10% change in this ratio (equal to our uncertainty about how well we know it) leads to a 13 deg F change in equilibrium temperature. What does it take to change that ratio? What if the reactor process affects albedo through indirect processes (such as sea floor vulcanism, or magnetic field modulation, or neutrino production)? When the parson’s wife is abducted by aliens—you just have to keep looking for clues! Has the author considered that even during glaciation the tropics remain steady and warm. If there was an internal energy source that ramped up and down why wouldn’t it have an effect on the tropics? Insolation is the answer, how it changes enough to cause the relative sudden warming and cooling of the higher latitudes needs to be discovered. Ronald: One factor that you may want to consider is the subsidence of continents under the weight of kilometers of ice and the rise of sea basins when the weight of 120 m of ocean has been removed from them. These changes might have some impact on heat flux from inside the earth. Even today, 10 kya after the end of the ice age, some locations on the planet are rising or falling more than 5 mm/yr. I can’t find much information on total subsidence at the LGM, but one can look at Greenland today and see that the center is 100? m below sea level. The usual maps of Antarctica apparent show what the continent would look like after the ice cap melted and glacial isostatic rebound. Like Greenland, the land surface of significant regions of Antarctic are below sea level. Now try to imagine what an ice cap the size of Antarctica’s did to North America. Cumulative subsidence over tens of millennia may have played a role in triggering deglaciation. Antarctica has been subsiding for millions of years. That didn’t address my point which was, if CO2 “takes over” – why does it “let go” so soon in the cycle while it is at it’s maximum concentration? That simply makes no sense to me. If you are intent on maintaining CO2 as a major warming factor, (at any point), then you must supply some ~other~ natural negative forcing much higher than the prior warming one to overcome the accumulated CO2 in order to explain subsequent temperature decline – how is that? AND.. if such a negative forcing is that high then why does it mysteriously ‘ go away’ right on schedule after temperature has gone back down? The data can be explained with CO2 doing virtually nothing at all so … it probably does virtually nothing at all. That’s a viewpoint iirc that rgb has also expressed, namely that of a bi-stable climate. A commenter here in the past espoused the conviction that glaciations start at the halfway stage of obliquity which we are currently about 500 years away from. Obliquity being precession in disguise as I understand it. Thank you for posting this idea worthy looking further into. Natural fission reactors seem to be pointing to this direction http://en.wikipedia.org/wiki/Natural_nuclear_fission_reactor. In addition, The Settled Science still seems to discover things about our globe http://www.livescience.com/29054-earth-core-hotter.html. To beat the dead AGW horse by the same token: if earth’s atmospheric carbon dioxide fitted a coffee mug, Venusian carbon dioxide would still need about 30 bucketfuls. How many SUVs would that take? Not even talking about the human efforts needed to move earth closer to the sun. You have a very interesting hypothesis. It has been known for more than a century that the earth’s heat flow is from the interior of the earth to the surface. The concept that the interior of the earth also has its own “weather” has been ignored by the GCM builders. They by default assume the earth’s heat flow is constant over (their modeled) time. With massive mantle convection cells moving continents around, it is unreasonable to assume the earth’s heat flow is uniform in geologic time (~10,000y). Is it reasonable to assume the earth’s heat flow is uniform for smaller time frames (~100y)? Is anyone aware of any attempts to measure the change in the earth’s heat flow over any time frame, large or small? @ blackadder. The ice cores suggest that increasing co2 caused by the rise in temperature from the exit from glaciation serves to arrest the increase in temperature, not drive it. It fits a mathematical and electrical model of that, complete with ringing. This is clearly visible in the graphs of the ice cores. I cannot see that the numbers add up for internal heat driving glaciation entries and exits, but I am interested in the idea that changes in the Earths magnetic field seem to be related to glaciation. It is also interesting that the Earths magnetic field seems to be declining in sympathy with that of the sun. Perhaps we should be looking for drivers (hammers) somewhat further afield. Wouldn’t the nuclear furnace at the center of the earth have burned up all the fuel long ago? Theoretically, how long could it last? Here is a related paper which speculates about magma and El Nino. …..Observed coincidences are often the basis for discovery, and reviewing the available data led us to note several. Two distinct phenomena—El Niños and earthquake swarms—seem to occur almost simultaneously in spite of their irregular recurrence rates and durations. Also, we found that what may be the longest lasting of the past six Niños coincides with the longest lasting and most anomalous episode of seismic activity, which occurred from 1964 through 1992 along the EPR from 15°S to 40°S. The current position of the continents/oceans — one without a circum-equatorial sea — and its influence on the distribution of heat on the planet is the reason we are in an ice age. I think most of us agree on that. Could it be that two regimes of ocean currents can exist within the current tectonic positioning, one causing a glacial climate and the other an interglacial climate? If this were the case, a large forcing change may not be needed to cause the shift from glacial/interglacial, just a mechanism that causes a change between the two circulation regimes which in turn leads to the various feedbacks. If there exists a single forcing that varies by enough W/m^2 to cause the observed interglacial/glacial changes then don’t you think we’d have found it by now? The variability of heat from the Earth’s interior — that Willis pointed out is rather small — may not be what makes it important, but rather that it is the only heat source on the most expansive surfaces of this planet, the abyssal plain and subsea montane. I think this hypothesis is definitely worthy of further study. Ronald, I like the idea. There is a lot of energetic things going on in the planet for sure. One type of good data that should be readily collectable – and there is also a fair amount of information on it- is the compositional differences of lavas over time. Here is a starter and it even talks about your time frame! “…..Iceland has almost the same distribution for these elements and also for Zr/Nb, in spite of their different tectonic situation. Iceland however, has few picrites but abundant ferrobasalt, icelandite and high Nb rhyolite sometimes derived from EMORB, never seen in Hawaii.” (MORB= Mid Oceanic Ridge Basalts). You may have to team up with a geologist/vulcanologist type to get a translation but I can see some 10s of thousands and hundred’s of thousands of years events here. Presumably when they become quiet during an ice age, the mantle rocks remix and start over again. This “fractionation” of composition should show in the parallel ridges going away from the mid Atlantic ridge. One could potentially measure the ages of the different cycles recognizable from their chemistry. Not that I have any expert knowledge of nuclear physics, but wouldn’t a concentration of Uranium, etc, sufficient to sustain a chain reaction burn out far too quickly for this mechanism still to be working after a few billion years? Suppose that there was a chain reaction that caused a huge pressure change in the middle of the earth. As we know, an object in the middle of the earth cannot fall lower down. And objects a few hundred kilometres away from the centre have a very low acceleration due to gravity. So is it possible that there was an initial chain reaction that exploded the U235 so far apart that the chain reaction stopped? Then over a 100,000 years, the U235 with a density of 19 g/cc would accumulate in the middle again until the concentration is high enough for another chain reaction, etc. Each time this happens, perhaps the resulting heat could escape via soft spots in the earth’s crust or oceans. There seems to be a disagreement between your two posts. If hundredths of W/m2 can affect the climate than a tenth surely should do it. I am not trying to play “gotcha”. I am just trying to understand what your “numbers” show. Maybe you were just being over generous with the “hundredths” comment? The problem I have is what causes cooling. More specifically what caused the Little Ice Age. So I would say in general we tend to over do the aspect of glacial ice cooling due to it being highly reflective. Being highly reflective does not make something particularly cold, rather the significant aspect of something highly reflective is it absorbs less radiant energy [and it emits less radiate energy]. As general rule the land does not absorb much energy. and Earth absorbs more energy. The moon does not absorb much heat because covered dust which prevents the conduction of heat from the hot surface. Our land surfaces are similar in that they tend to not conduct heat well, but Earth surfaces don’t in degree insulate as wonderfully as the lunar surface. In addition to just the skin surface, on Earth one has atmosphere, and gases warmed by hot surface, and the warmed gases rise, and cooler air replaces it, and also warms. So Earth land absorbs and retain heat by conduction of heat beneath the skin surface and convects heat into the atmosphere. But both this conduction and convection does manage absorb a lot of energy, and so the land doe not absorb much energy. Since the land does not absorb much energy, if cover land with snow, the snow does affect how energy the land absorbs. Or if the land somehow were absorbing a lot of energy, and it was covered land with snow, one could make a big difference. Or cover the Moon with snow or non-evaporating fake snow and you might increase the amount energy the Moon absorbs rather than significant decrease how much the Moon absorbs. Or the color of the Moon or how reflective the Moon is has little to do with it’s temperature and far less to do with it’s average temperature. So a shiny white car or town paint white should have slightly warmer temperature, but mainly it affect how much energy is absorbs and so should./could affect temperature when sun goes down. as there less heat stored which can radiate at night. Now the ocean are example of surface which does absorb a lot of the sunlight’s energy. And most of energy of sun is hitting tropical area of earth. So tropical oceans are absorbing a lot of the energy from the Sun. And so if one could put snow on tropical ocean one would be having a huge effect upon amount energy the Earth absorbs. So basically tropics warms the world and rest of world is warmed by the tropical energy which has been absorbed. And Snow of glacial is not going to have a large effect upon global temperatures, but they do a have significant regional effect. One could say glacier are the opposite of urban heat island effect. And having a glacial “could” cause a growth in the glacial. Though glacial tend to make things drier, so they also cause less glacial growth. If glacial can fed moisture they will grow. I don’t buy it. Any variability of any reactor should become less pronounced with age. These regular interglacials paced at about 100K years apart only started in the past 3 million years, after 4+ billion years of radioactive decay of the materials that make up the planet. I look at the system as, in electronics terms, a comparator with hysteresis. There is a stable high state and a stable low state but you have to overcome the reference either positive or negative by the hysteresis value before the system changes state. I also believe that the hysteresis is controlled by summer polar region ice. Arctic ice to be exact. When the solar insolation drops to a point where the planet COULD latch into the stable cold state, I believe there needs to be enough summer ice to actually do that. The amount of summer sea ice is variable, possibly somewhat cyclical, too. Or maybe it needs a combination of things to flip the state. Maybe it only flips cold when you have a solar minimum, high summer sea ice, and possibly a volcano at the same time that insolation is below the threshold. So imagine you have some reference value on one comparitor input, as solar insolation drops crosses that reference, it doesn’t actually flip state until it exceeds the hysteresis value. Now comes along a summer with more ice than usual, a solar minimum that reduces UV and possibly increases clouds a bit, a volcano erupts and it causes enough of a wiggle in the temperature to exceed that hysteresis and flip the system. In the cold state there is such an abundance of NH polar ice that it never melts in the summer and ice begins building up until the cycle comes around again to increase the insolation again. As the insolation increases, the ice on the Arctic ocean begins to shrink, possibly even while the land area around it has ice a mile or more thick. At some point the there is enough arctic ocean exposed in summer to absorb a lot of solar energy and whammo, the system flips rapidly into the warm state. Here we are today toward the end of April. Lake Superior is still mostly frozen. That is a lot of solar energy that is not being absorbed by that lake. The St. Lawrence River is going to be adding water much colder than usual to the Atlantic and it will be more than usual lately because the ice causes reduced evaporation and the lake levels will be higher. So there is going to be less solar energy transported into the Atlantic by that path. We’ll have to see how Hudson Bay ice behaves, but if it stays longer than usual, that will also mean even less solar energy being transported into the North Atlantic and Arctic. Or obviously the growth of glaciers in Europe did not cause the Little Ice Age, but were rather a result of Europe not being warmed as much as it was being warmed, though a large increase in a glaciated area would have some regional effects upon local temperatures. So some things which could have been responsible for Little Ice age is the larger more powerful volcanic eruptions which did occur and lower solar activity which did occur, but I don’t this is complete process which were responsible, so it seems to me there are still questions about what caused the Little Ice Age. I can see in my minds eye that an increase in pressure and temp of the earths inner core could heat the oceans where the mantel is thinnest and I can see how the increase in temps in the inner core could weaken the earths magnetic field. Now if the temp and pressure dropped would that cause a period of glaciation such as Yellow Stone blowing it’s top releasing the pressure and reducing volcanic activity for thousands of years until the pressure builds up again. Could that be the trigger to a ice age? Finally, I didn’t see any numbers regarding the amount of geothermal heat that reaches the surface, regardless of its source. True, Willis re numbers and “reaches the surface”. But where does the heat go from all the basaltic extrusions along oceanic ridges related to plate tectonics (e.g. “the ring of fire”)? – Clearly, into the oceans. Given the agreed oceanic influence on climate is it correct to dismiss this mechanism completely even though there are no “numbers”? Seems to me worth exploring given billions wasted already on chasing the CO2 villain. “Scientists like Hansen and Mann tend to dismiss solar influence […] because it’s difficult to imagine a solar explanation to major climate change in the absence of powerful positive feedbacks. And when you invoke powerful positive feedbacks to create an explanation, you then get caught up into alarming tipping-point hypothesis.“. That touches on one of the major weaknesses of CAGW and the IPCC reports: They rely heavily on feedbacks for their CO2 ‘forcing’, yet deny the possibility of any indirect solar effect. Incidentally, I prefer ‘indirect effect’ to ‘feedback’ because ‘feedback’ is too narrowly defined by the IPCC. On this essay : Interesting idea. Let’s test it. The first reaction to any new idea should be “How can we test it?”. If this had been done in climate science, it wouldn’t be where it is now (in the mire). Roy Spencer Apr 24 9:12am – That’s the best brief comment I have seen in years. 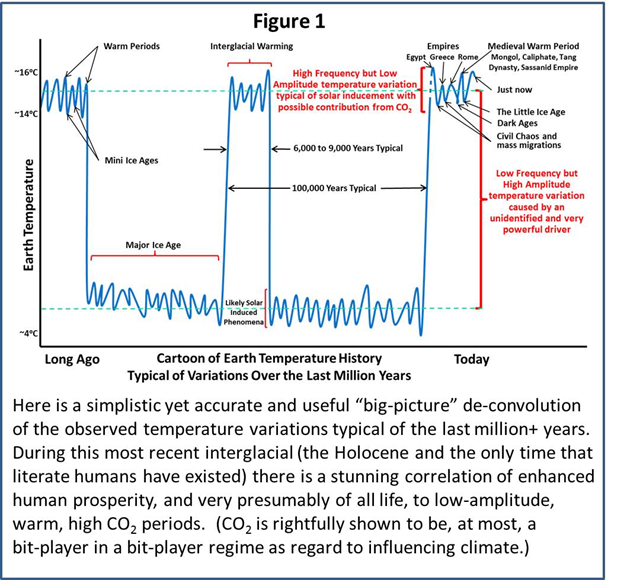 Tim Obrien Apr 24 10:04am – “just one of the components of the climate engine“. Exactly. ‘We’ keep looking for a single cause over all timescales. ‘We’ need to get smarter. Sorry but I just haven’t had time to read every comment. At least we should look at the heat of the core and if it varies. The internal circulation might alter the rate of heat transfer to the mantel from the core. Gravity variations may alter circulation meaning fission and transfer both might vary as a result. Does subduction cause a change in what the mantel is made of? Even the makeup of the core slightly. Different materials may transfer heat at different rates and/or change the fissionable’s proximitry effect. Perhaps an “accidental” cycle when several positives (or negs) occur at the same time. The glaciation may reduce heat loss contributing to its own demise? Many small effects acting together? Or with one or two large effects. You are not taking into account that when the geo-nuclear reactor is subdued, the earth’s magnetic field changes as well. Would this change be enough to allow warming from increased cosmic rays? the Sun operates on the Earth with huge positive feedbacks. This simple fact all but eliminates it as the prime-driver. But it is not globally glaciated. Where? North or South. There are big differences. Due to water content, currents, etc. Personally, I would suggest that if the Northern landmass existed in the South, at present we wold declare an ice-age. Interesting thought, that a little heat where there is very little heat might be significant. Let me think how we might estimate that … OK, back-of-the-envelope. Circulation from the equator to the poles and back to the equator might take maybe a couple hundred years. Imagine water sinking at the pole, spending 100 years at the bottom moving equatorwards, and then rising. Over that century it will absorb about 285 megajoules per square metre from the 0.1 W/m2 of geothermal heat. In rough numbers, it takes about 4 megajoules to warm a cubic metre of sea water by one degree C. But remember, we’re looking at the bottom half of the flow, not just the bottom metre. As soon as the water becomes even mildly warmer, it will tend to rise and be replaced by cooler water. So we’re talking about the bottom 2,000 metres or so, half of the average depth, that’s getting warmed. At 4 megajoules per cubic metre per degree, 285 megajoules will warm that lower 2000 metres of equator-bound bottom water by about three hundredths of a degree … in a century. Seems to me like the only effect would be to set up a slight, glacially slow vertical abyssal circulation, that won’t have much measurable effect on … well, much of anything. 1. The Sun is part of a binary star system, every circa 100,000 years its dark companion approaches on an an unimaginably elliptical orbit and causes havoc. 2. Iceland – a totally volcanic island, most of which is less than 2.65 million years old (the start of the Pleistocene Era). Major eruptions there every circa 100,000 years could have a major impact on climate. 3. Submarine volcanic activity on the floor of the Arctic Ocean. — Let me propose the trigger that Velikovsky proposed over half a century ago. I propose that a planet with no polar ice caps represents the natural temperature equilibrium. The primary trigger which leads to abrupt climate change is a massive asteroid strike that rings the earth like a bell. If this is correct, the polar ice caps will eventually recede no matter who is right in the current debate, and it will happen no matter what actions we take. We will simply be unable to prevent the planet from returning to its equilibrium state. Resulting worldwide volcanic activity also provides a mechanism for heating and vaporizing the vast quantities of water needed to move water out from the oceans — as well as the atmospheric cooling needed to keep that water vapor on the land masses. Remember, if it just gets colder, the oceans simply freeze in place. Vast amounts of heat are needed to have an ice age. If surface albedo should lock us into either a warm interglacial state or a cold glacial state (and I agree it should), then Occam’s Razor says, changes in surface albedo cause the transition between the 2 states. The difference between snow/ice albedo and vegetated surface albedo is so large (around 0.5) that any other mechanism seems impossible. There is only one candidate for a regulator of snow/ice albedo, and that is black carbon. Sea level is the main regulator of atmospheric black carbon. As sea levels fall, coastal swamps dry out and fires increase. As sea levels rise, coastal swamps are inundated and fires decrease. This gives us a roughly sub-millenial scale regulator of climate. In order to explain the glacial/interglacial shifts, we need to consider the black carbon embedded in the snow and ice. When, for whatever reason, snow/ice melt has a relatively small increase, say due to Milankovic Cycles, then the embedded black carbon accumulates on the ice/snow surface greatly reducing its albedo to around or below that of vegetated surface, and causing the rapid transition from glacial to interglacial states observed. You have correctly identified the issue – what could overcome the very large albedo difference between snow/ice and vegetated surface to cause the glacial interglacial transitions? – but your heat from the Earth’s interior theory seems to me, far to small an effect to cause the transition. As to the change in the interglacial spacing, I would look to the evolution of the South China Sea, which is a vast forest swamp during glacial periods. On the continental crust, up to 100km thick, this heat pulse would be identified by all of the geo-thermometers, particularly vitrinite in coal. There is really no evidence of this. With thin oceanic crust (~5km) covering 70% of the globe, its more likely most of the heat would be transferred here, and therefore heating seawater. I dont believe there is much fossil isotope or other evidence for significant heat pulses into the ocean bottom waters. I believe that a major cause of ice age cycling are the oceans. From what I have read, the climate undulations that eventually resulted in the current ice age cycling got their start more than 3 million years ago when North and South America connected changing ocean currents. The ocean acts as a huge nonlinear thermal capacitor and the earth underneath it adds to its thermal capacity. We have experienced relative short term ocean oscillations and have measured their effect on climate but the longer term cycles are unknown and could relate to the ice age cycling. Part of the ocean effect is at least quasi linear so the same frequencies in solar cycles are reflected it. If it is a purely linear system, input frequencies are not changed in terms of the actual frequencies. The magnitude of the frequencies and their phase can be changed by the linear system but not the actual frequency wave length. But such is not the case with non linear systems. A large part of ice age cycling could relate to nonlinear ocean resonance frequencies. Variations in solar activity are one input and variations in the earth could provide another. There is no evidence that CO2 actually affects climate. For those who embrace the misnamed greenhouse theory, the primary greenhouse gas in our atmosphere is H2O which provides ample negative feedbacks to changes in CO2 so as to mitigate any effect CO2 might have on climate. Besides being a greenhouse gas, H2O is a major coolant in the Earth’s atmosphere moving heat energy from the earth’s surface to where clouds form and where earth radiates to space in LWIR absorption bands. H2O coolant propertierepresentsts a negative feedback. Clouds represent another negative feedback. It is not just that clouds reflect incoming solar radiation but they radiate to space much more efficiently in the LWIR then does the clear atmosphere they replace. Thpro porteded warming effects of CO2 in the lower atmosphere causes cooling in the upper atmosphere. The cooling reduces H2O in the upper atmosphere which counteracts the effects of adding CO2. This represents still another negative feedback. Negative feedback systems arinherentlyly stable and our climate has been sufficiently stable to changes in greenhouse gases over the past 500 million years to allow life to evolve. We are here. greenhouseouse gases have been a significant contributer to climate change then the real culprit is H2O and not CO2. If more CO2 eventually entered the atmosphere because of ocean warming then so did H2O but more quickly and at a faster rate. If H2O did not provide the negative feedbacks that it does, the oceans would have boiled away eons ago. The estimated heat from the interior of the planet is orders of magnitude too small to explain the ice epochs on the earth. Regardless of the estimated heat from the interior of the being orders of magnitude too small to explain the ice epochs, there is no mechanism to cyclically increase and decrease heat from the earth, to cause the massive saw tooth change in planetary temperature that is observed (see next link). What is causing the massive saw tooth change in temperature during the ice epochs, including the current ice epoch is the same mechanism that causes the ice epochs. The hypothesis proposed in this thread seems therefore not to be viable. The time span of the past few million years has been punctuated by many rapid climate transitions, most of them on time scales of centuries to decades or even less. The most detailed information is available for the Younger Dryas-to-Holocene stepwise change around 11,500 years ago, which seems to have occurred over a few decades. The speed of this change is probably representative of similar but less well-studied climate transitions during the last few hundred thousand years. These include sudden cold events (Heinrich events/stadials), warm events (Interstadials) and the beginning and ending of long warm phases, such as the Eemian interglacial. Detailed analysis of terrestrial and marine records of climate change will, however, be necessary before we can say confidently on what timescale these events occurred; they almost certainly did not take longer than a few centuries. I couldn’t get past here without comment. What evidence do you offer for that statement. I would say exactly the opposite; the sun operates with huge NEGATIVE feedbacks, which is why it doesn’t seem to affect anything. Willis described substantial periods of MEASRED low insolation levels, due to Pinatubo, et al Eruptive events. Those measured lows persisted for many months to several years. Time enough for stuff to cool with the lower ground level insolation (locally). Yet absolutely NO Temperature signal showed up in response to that sizable insolation drop. Clouds of course are the feedback mechanism that regulate the earth’s temperature. So nyet, on solar action with positive feedbacks. Water vapor and clouds block solar energy, thereby warming the atmosphere, but cooling the surface, and heat cannot travel from the warmed atmosphere to the warmer ground, and any atmospheric radiation, is isotropic, so only half of it can reach the ground, and in the case of the oceans, that simply sponsors evaporation, which puts the heat right back in the atmosphere; not the ocean. But I’ll read on anyway. I think when many variables are involved it is hard to pick just one causation factor. We’ve flipped in an out of glacial eras with a few mini ice ages occurring in a interglacial. We do know the gulf stream keeps North America and UK warm especially the Scilly Islands. (They are on the tip of Lands end and most probably in a glacial period were attached to Cornwall, and there was more land exposed than today, everywhere! The Med was a series of swamps, Gibraltar connected to North Africa. The Southern hemisphere, well in Australia there were a few glaciers, especially in Tasmania, and the tree line was lowered everywhere. But the Aborigines managed OK.
Fun stuff. Let’s see if we can get Bob and Willis more involved. I don’t think enough heat can get to the surface through the mantel. However, major oceanic volcanic events could easily do some important heating. The mid-Atlantic ridge could heat the Atlantic across a great distance. The recently located Massive underwater volcanic seep in the Pacific could have done the same thing. Since we often are talking about pretty minor temperature changes causing pretty major things (5ºC), could this be enough? So Bob, if the temperature of the core PDO region were to increase by a few degrees, what would that do to the Pacific system? Similarly, any increase in Atlantic temperature would likely be confined to the Atlantic, possibly separating the timing between oceans. Willis, would a quick temperature change in the oceans create major disruption/spatial change etc in the convective systems, Hadley circulation etc. What-if’s can be a lot of fun, and may lead to new ideas. Since everyone seems to agree that the earth’s climate is a fairly refined system (limited variation over time) it may not take much to create perturbations. There is a somewhat credible theory, that a natural deposit of Uranium (ore) / Thorium /xxxium / whatever, some where in Africa, went critical, and set off a fission nuclear chain reaction; but evidently not a bomb. The alleged event has been reported in Sci-am and the like, and is evidently given some credibility. So the possibility of a critical mass, of presumably ordinary U238, with its normal isotopes added at the center of the earth is intriguing. but please don’t plead a gravitational segregation by density of the radioactive elements; they don’t exist as native metals. And there is very little gravity at the center of the earth; well none at all at the true cm. The outer shells contribute nothing to the gravity inside. I believe current thinking is for iron at the core; not that it is needed for magnetism, since it is way above the Curie Temperature for iron; millions of degrees according to Algore. I’ll except the maybe a few thousand, that seems more plausible. So ordinaryradioactive decay, is considered highly credible as an on going internal heat source; but actually a rather pitiful one. I’m sure geologists have many times measured the radial outgoing thermal flux, and found it quite uninspiring. Prominent enough to not even make it on to Kevin Trenberth’s Earth Energy Budget (actually its a power (density) budget.. But I’m going to keep on reading anyway. There is a somewhat credible theory, that a natural deposit of Uranium (ore) / Thorium /xxxium / whatever, some where in Africa, went critical, and set off a fission nuclear chain reaction; but evidently not a bomb. Yeah, Keith linked it here. I’d never bumped into it before, pretty cool. As already mentioned, the average geothermal flux is 0.1 W/m^2. 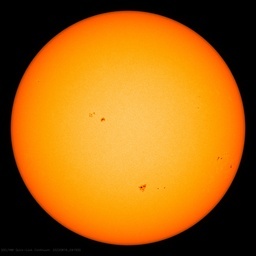 This is very small compared to solar flux of 200 W/m^2 and the “back radiation” of greenhouse gases of over 300 W/m^2. The geothermal flux is so small it cannot even heat the ocean floor, which is at 3 C, over billions of years. Earth surface temperature depends on geographic location because solar radiation has greater influence. If geothermal energy is the driver, surface temperature will be hotter in volcanic regions like Iceland than in the tropics. Referring to seismic and volcanic eruptions during the last glacial period. Japan was almost uninhabitable, there were no settlements. The islands that were separated eventually had increased volcanic and seismic activity than today. I am not sure that the same happened elsewhere. Cheers everyone. Enjoy the sunlight. Either that, or no grant-sucking pseudoscientists were able to figure out a way to get rich off it. This is my very first venture into the blogosphere so I hope people will forgive me if I haven’t got “the hang of things yet”. I have a basic difficulty with just about all the above posts in that they seem to assume the Earth has been for millions (if not billions) of years plodding around the Sun in its present orbit. Archeology in human recorded time shows that this cannot have been – changes in the direction of revolution (Sunrise in the West), and changes to the length of the year. Changes in the inclination of the Earth’s rotational axis w.r.t. the present are evident from Mesopotamian records, and from the limits of glaciation over the North American continent for the last glaciation which describe a circle about a Pole far displaced from its present position. We must be able to explain these facts in any construction of recent Earth events, let alone those further in the past. A second difficulty I have with the matters discussed above is that there seems to be an implicit assumption that Ice Age causation only needs the Earth to cool. If that were the case then after reducing the atmospheric water concentration by precipitation of some small amount of ice, the planet would then settle down to a new equilibrium regime, without a huge Icecap being formed. To produce the glaciation imagined in an Ice Age stupendous amounts of heat must be generated to cause the evaporation needed to deposit the mass of ice required – and do it quite rapidly. Oceans would need to boil to make that happen! A third and final difficulty concerns the general acceptance of a Universe controlled by gravitation, mass, and chemical/physical reactions, and a reluctance to understand these Ice Age matters in the light of such phenomena as electric charge, electro-magnetism and plasma physics (all of which were either not understood or unknown to Newton or to present day Astronomers, or climate “scientists”). The Sun, our solar system and our galaxy show all the signs of being electrical rather than mechanical, and I believe progress will only be made once we start looking seriously into the effects they have in our Universe. For this theory to have any merit, a geothermal flux approaching zero would result in a descent into an ice age. The the current geothermal flux is approaching zero (a fraction of watt compared to insolation at hundreds of watts is, for these purposes, the same as zero) but the earth is currently not descending into an ice age. In fact the opposite, it has been on a warming trend for the last 400 years or so. So half the theory dead on that issue alone. Now, could an uptick in geothermal flux kick the planet out of an ice age? Seems to me that is the same problem in reverse. You can’t postulate an increase in geothermal flux that large without either a massive disruption of earth’s crust on a scale that would make Krakatoa look like tiddly winks, or an increase in fission of radioactive materials that couldn’t occur without some physical process to dramatically increase concentration, which would imply a LOCALIZED concentration because a globalized concentration is already global. In turn, a localized increase in concentration (or even dozens of them around the planet by astronomically large odds occurring in the same approximate time frame) would also be disruptive on a scale that makes Krakatoa look tiny. There’s been plenty of other issues raised above that are even better criticisms. The real tragedy of this hypothesis is that it comes just as modern seismology is showing that the mantle is stratified and not convective. That what we assumed were plumes are shallow hot pockets of unknown sustenance underlain by colder layers. The ocean spreading ridges are also fed from shallow molten pockets without apparent mantle support. Well Richard Courtney related once, that geo-thermal was tried in Cornwall, but the vents closed up due to gravity. At least that is what I remember. They have tried it in SA and had to close when the government withdrew funding. I also recommend the SoD series “Ghosts of Climate Past”. The ‘settled science’ of orbital forcings is not settled at all. With regards Astronomy, can’t they calculate back to the orbit that the sun and solar system were in around the 14th Century? However, I can’t recall any bad volcanic eruptions in the 1300s and 1400 AD. And I don’t think the sea levels dropped that much at least like a full glacial time? Be interesting to compare data. Ps. I do recall that during one of the crusades, the northern lights were spotted further south than usual like recently. with I the amount (moles) of ice and Wo is the initial amount of water available for freezing, so Wo-I is the amount of water at time t. k(I) is the fraction of water converted to ice per unit time; this depends on I through albedo effects. It is claimed that as k(I) increases with I the system is unstable. But this neglects the other term Wo-I which decreases with increasing I, eventually to zero if the process continues long enough. The same considerations apply when ice melts. Or, more simply: the freezing process eventually stops because you run of water, and the melting process stops when you run out of ice. So say is smallest size type impact, say could as small as 50 meter diameter if moving fast. And on large side, say 200 meter diameter. it hitting in deep ocean. This will create large ocean wave which travel at supersonic speed. Nothing we have actually seen, but they have been modeled. For asteroids coming in at 20 km/sec, it’s generally thought that to penetrate the atmosphere and cause major damage by tsunami, an iron asteroid must be around 40 to 60 meters in diameter, and a stony asteroid 200 meters in diameter. An impact of this magnitude can be expected to occur on Earth about once every 300,000 years and approximates what scientists consider to be the “global catastrophe threshold,” he says. So this bigger, but 20 km/sec is average velocity, faster it hits the more power. But my point is these smaller rock don’t do much to Earth, but might do a lot to Earth oceans, so fast moving ocean starting at say 50 meters or more and over large part of ocean at say 20 meter high. And question is what kind effect would do the ocean surface temperatures. I can just remember, my lecturer told me or fellow students, that the sun has little influence on earths temps. It is the land that reflects heat into the atmosphere. So why is space freezing cold eh? And why do we get sun burnt? Sometimes I get very confused, but when it comes to all the contributions to our climate and weather, it is our orbit around of the sun that dictates seasons. Camilla’ my second computer is naughty tonight, as I have switched off ‘Charles’ my favorite computer to give her an airing so to speak, since I have been switched over to NBN or National Broadband network, that is fiber optic generated although I still receive Wireless Network 3 as I did before on copper wire. But sometimes it gets very slow for some reason, outage, they say. I do hope you folks, understand. I wanted to add, that actually so many variables were involved during the last glacial periods and inter-stadials, (Also known as inter-glacials) that sometimes these inter glacials did not last long, possibly only 100 years then reversed and only in parts of the globe. One thing we can be sure of, the last 9,000 years at least have benifited human kind. What the next 9,000 years will dictate should another full glacial arrive is how successfully we adapt to it?! I still believe some scientists (some can not qualify for that status admittedly) employed with alarmist grants and governments who encouraged them, knew that another vast cooling period might come sooner than expected, that would be more damaging that a mere .2C (bloody nothing) increase globally. I think what I fear is precipitation will be effected in some areas and regions, and of course all life requires appropriate and life giving water. Stuff the CO2. I’ve just caught up with this. A hypothesis about climate change is offered for criticism and comment? Isn’t that contrary to the basic precepts of climate science? Always good to be creative but this is more of an excercise in science fiction than science. As Willis points out a tad short in the maths department. There are suppositions on inferences on theories here. But just to point out one flaw, isn’t the reason a nuclear reactor or bomb works is because the uranium is enriched? Ie. if all the uranium somehow managed to get accumulated at the core, how did the separation of U235 happen ? If it’s just existing in its natural ratios nothing is going to happen. You are right about one thing though. The reason we are in a period of ice ages is because there is a continent over the South Pole. So it is all linked to the plates. But why we peiodically emerge from the frozen state is a bit more of a mystery. Fair question. I have only just read this so I don’t know if I am too late to comment. I loved the exposition of how difficult it is to match the actual ice age cycles to known variables. However I don’t like the hypothesis proposed to overcome these difficulties. The periodicity is very regular and linked to the Milankovitch cycles. It suggests an astronomical dimension rather than a geophysical one. Svenmark is credible, and there must be other possibilities, but I would not jettison a primarily insolation based theory quite so readily. Furtherfore the fact that the transition from the expected 41K cycle that existed up to 4 million years ago to the 100K cycle from 2 million years ago coincided with the closing of the isthmus of Panama suggests that the feedback mechanism is probably ocean related. One possible error in the logic is to assume that increasing ice cover leads to increasing albedo and this leads to decreased energy absorption and permanently lower temperatures unless you invoke an even bigger countercyclic forcing mechanism. This chain of logic is missing a key variable – the energy emitted from the surface. Could we conceive of a situation where the reduced energy absorption coincided with an even bigger reduction in energy emitted? Such a scenario could lead to an immense increase in stored energy. What then if this coincidental reduction in emitted energy was subject to sudden reversal? Consider the growth of sea ice triggered by the Milankovitch cycle. Initially there would be a negative feedback as the ice cover reduces albedo and reduces energy absorption around the poles. However the energy absorbed by the sea between the tropics would be relatively constant. Do we know enough about this climate system to know how this energy would be distributed in a world with so much ice cover? In the interglacial period we know that the majority of this energy is moved towards the poles by way of the Hadley cells and this allows the average surface temperature to be much higher at the poles than the solar energy balance would predict. This then allows more energy to be radiated into space and this cools the planet. One could conjecture that during the ice ages the energy is redistribed northwards under the ice. In this scenario there would be no increase in the energy lost to space so we would have the bizarre situation where the energy balance was positive even though the average surface temperature was lower. The balancing factor would be the increased average temperature of the deep oceans. Eventually of course the warmer waters would gradually melt the ice from below. The latent heat would cool the water so the process would be slow but the positive energy balance would persist until the last few millimeters of ice melted. If the currents ensured that this melt occurred over millions of square kilometres at the same time there would be a sudden release of energy into the atmosphere and a huge decrease in albedo. This would mark the onset of the interglacial which would last as long as it took for the stored energy of the previous 90,000 years to be dissipated by the increased surface area of warm seas and snow free land. Eh. This has been settled — Milankovitch cycles are remarkably correlated to ice-growth/melting. The only remaining questions are how the mere decade-long major changes are produced. Ice-shelf formation/breakup is the best guess so far. The periodicity can also be explained by the gradual accumulation of fission poisons, reactor shutdown, and gradual radioactive decay of the poisons, with reactor restart. I have no problem considering a deep interior model that is other than the standard heat-engine earth proposition of plate theory which is quite inadequate on many grounds, and which I rejected two decades ago as viable or credible. And I do accept we have no good data on possible geodynamic energy pulsation that may affect igneous and seismic activity on suitable scales. Given we understand the internal geodynamic mechanism so poorly I can accept that such regular pulsation is not impossible to exist. I’ve considered it previously and supposed that perhaps tuff deposits could reveal such a variability with time. But I do wonder how this idea fits with that slowly emerging glacial to interglacial pattern, that we see has emerged since 5 mya. (1) I don’t perceive as yet a reason to seek a geodynamic explanation for that glacial-to interglacial pattern emerging as it has. (2) Occam’s razor suggests I avoid convoluted adhoc theory. (3) If it can not be tested for, or observed, its imaginary, until proven otherwise. I thought everyone knew that the Earth has had nuclear energy since it began and its age is one half-life of U235. The graph shows that interglacials happen suddenly, but the descent into an ice age takes place very very slowly and erratically. But I take anything related to paleogeology with a grain or two of salt until they upgrade their understanding of plate tectonics. We began geology with the local observation that the Earth is flat. More advanced civilization discovered that the planet as a whole is a gigantic sphere. The earlier theory wasn’t actually wrong, just limited in scope. The Earth is so big that it appears flat for several miles. From 1492 through about 1800 or so, we explored our big Earth and mapped its continents and islands. We thought God had created it that way and it stayed in our current configuration until the End of the World. And that is close enough to the truth over human civilizational time. Over larger periods, however, Wegener’s discovery of Continental Drift was proven true when we discovered a subduction zone and could understand a mechanism for continents floating around over the surface of the planet. The theory was true before we had a mechanism for it. That is important, because the next breakthrough is mind-boggling: the diameter of the Earth is expanding. In the time of Pangea, it was around 70% of its current diameter. The Cambrian and Devotion life were sea-bottom and mid-ocean because there was no land. By the Permian, the first swampy land areas came to be and amphibia and certain plants colonized the land as soon as it thrust up above the waters. The real tragedy of this hypothesis is that it comes just as modern seismology is showing that the mantle is stratified and not convective. Yes, I also pointed out about 15 years ago that a global convective cell movements in the upper mantle, required by plate drift modeling, inescapably implied there can be no continental crustal plate decollement surface that allows a continent to ‘float’ on and above the mantle and that a ‘deep-root’ structure was thus dynamically quite impossible. And that plastic deformation could not possibly provide any horizontal solution that fit the evidence of both ‘drift’ and the required convective down-welling, plus the fact that we have ~4 billion year old cratonic rocks at the surface in places. In other words the whole continental crust should and physically must convect, with the mantle, as one unit if such convection were in fact present. As that means the continents plainly aren’t convecting with mantle convection cells below them there can be no convection cell in the mantle below any continent. In which case the conventional model of geodynamics plate drifting has a terminal problem; it actually can not explain the splitting of larger continents apart to open a new ocean basin, plus the fact that almost all ocean crust is less than 200 million years old if there’s no convection moving the continents. And clearly the energy required to do all that work in the mantle is not present because the radioactive atoms are in the crust, not in the mantle rocks. Thus there is both no mechanism and no energy where you need it, to power the theorized density driven plate drift theory. It was a nice theory but plate drift was rendered dead as a dodo. Yes, temperature is copying co2 in advance! The ultimate driving machine. The radioactive elements differentiated from the bulk chemistry and were concentrated into crustal rocks, thus the heat source is in the crust, not in the base of the mantle, where a mantle convection mechanism would need it to be, for it to power a density-difference convection process. This geo-reactor concept thus seems to be an attempt to get around the terminal failure of the mechanism of plate drift theory due to its lack of a heat source, via proposing a source of heat were it actually needs to be, for there to be any prospect of continuous mantle convection to occur. Yes and no. Yes, internal planetary nuclear reactions are an intriguing area to explore. No, it won’t be because gravity pulls heavier species to the center … ultimately, because the gravity field declines to zero at the center. Even if there was some kind of reactor phenomena at work at the core, it would not have arisen because gravity concentrates the heavy stuff in anything like a compact central region. Gravity-driven density-gradients are strongest at the surface, and lose strength steadily beneath the surface. Because material at any given depth beneath the surface experiences gravitational attraction, from the stuff above it. Fractionation based on gravity-sorting will be most-pronounced, at the surface; it declines beneath the surface, and is zilch in the broad vicinity of the core. The good news is, nuclear phenomena might be taking place under conditions that are easier to replicate & closer at hand than those at the core of a planet. Twenty years ago, it was popular among certain elements of our population to claim an affinity to, even a genetic derivation from, the Neanderthal. And it had been, for many generations. No degree of scorn or ridicule was deemed excessive, for the presumed mental defectives who spouted such nonsense. Then, oh crap, it turned out the imbeciles were right (and their Betters were wrong). Twenty years ago, it was obvious that questions like, ‘Are we still part-Neanderthal?’ would be answered soon enough by the rapid advance of genetics … and thus prudent individuals could shrug; ‘Keep yer shirt on. You can almost hold your breath, until we actually know’. Today, the potentially rapidly changing factor for internal planetary nuclear energy generation questions, is neutrino-detection. Our current neutrino ‘instrumentation’ is infantile, crude and ineffectual, in the extreme. The first baby-steps in ‘realistic’ neutrino-interaction capability, will lead to explosive advances. The idea that novel nuclear processes are creating heat inside planets is going to be ‘one thing’, while trying to invoke any such phenomena as the drivers of major climatic patterns, is going to be ‘another thing’. Whatever the source of internal planetary heat, it’s very small, compared to assorted external drivers. When I was doing by B.Sc. in Geology nothing was settled. We were encouraged to debate and question everything. Likely because the professors had all lived through the Plate Tectonics revolution. In any event it was accepted that the core of the earth produces heat via fission since planetary theory would have most heavy elements, which includes important radioactive elements, settling in the core. It was also assumed that the crust is a good insulator and keeps the internal heat from dissipating very quickly. Hence the heat flow from the earth is very small compared to inflow from the sun. That is why geothermal energy production is only really worth it in areas where the crust is thin – like Iceland. Now as far as reactor cycles in the Earths core I am skeptical. We know that mantle plumes happen and may cause mass extinctions – the debate is ongoing. But, if there was a regular cycle that produced Ice Ages, we might assume it has been operating far back in deep time, as opposed to the Pleistocene. As for the Pleistocene there is no doubt there is a climate driver that operated initially on 41ky cycles and then abruptly changed to 100 ky cycles. The Milankovitch theory does not explain how or why this happened. The interior reactor theory, in my view, does not produce enough heat to account for this. the suspect, in my view is the sun. Looking for “reactors” in nature that bear a working comparison to human technology solutions makes things a lot harder than they have to be. The Sun, for example, is popularly celebrated as our great thermonuclear reactor in the sky … but the reality is drastically different. The volumetric energy generation of our star (and others) is approximately the same as a backyard compost heap. Under favorable circumstances, even rich garden soil or bog-muck will generate as much heat-energy as the Sun, volume-for-volume. That the Sun fuses hydrogen into helium, and releases surplus energy in the process, does not make it a specie of “fusion reactor”. Similarly, although there might-could be nuclear phenomena at work inside planets, it is highly adverse to attempt to model such ideas in terms of the operating principles of human reactors. Instead, when considering nuclear events in the interior of a planet, look for (extremely) diffuse effects that take place in a distributed manner, rather than in a localized, reactor-like context. A quick correction on the heat of the earths core in my previous comment. It seems to me that the theory was that simple radioactive decay would produce heat that would keep the core/mantle system from cooling very rapidly. Fission is not needed. Herndon makes the point that, because of the increase of density with the decrease of radius, there can be no large-scale (mantle or outer core) convection (cannot get a Taylor column inversion). His issue is the idea that the georeactor generates the terrestrial magnetic field. As for things settling to the core, that is exactly the process that was put forward in (I think) the 1970s for the heat generation of Jupiter: subsidence of planetary helium to the core, displacing hydrogen, and thus releasing heat through conversion of potential energy. As long as the mantle/core region is at high temperature and has fluid characteristics, the heavy will settle to the center…for the simple reason that the less dense will work its way outward through Brownian motion. That bias will be preferred because it leads to a lower (potential) energy configuration. It may not be much, but we have billions of years to work with! What is sauce for the Darwinian goose, is sauce for the georeactor gander. Here’s another interesting thought. Such a georeactor would produce surplus neutrons. What happens to them? Some would be absorbed by neighboring nuclei to transmute them into heavier isotopes. But some would decay into a proton and an electron, in effect turning into hydrogen. What happens to that hydrogen? This leads into Vladimir Larin’s very intriguing theory for the interior structure of the Earth having a core of metallic hydrides. (See his book, Hydridic Earth at http://www.polarpublishing.com/.) Hydrogen, by the way, is a most excellent neutron moderator. During glaciations there is reputedly some 1 to 2 kilometres of ice which would take 10 to 20 kilometres of snow. That surely isn’t going to be a quick process even if the initial cooling impetus is, though that needn’t be either. 20 kilometres of snow spread over 100,000 years is just 20 centimetres per year. Sure 20 kilometres of snow may be 20 cm per year over 100ky but the data we have from the last Ice Age is that the climate was chaotic compared to the Holocene. Burroughs calculated that the variance in annual mean temperatures was an order of magnitude greater than now – that’s crazy. Furthermore, the Ice Age climate was not uniformly cold. Summers may have been almost as warm as today in some years, but winters were brutal. Then there was the crazy see-saw pattern of Daansgard-Oescher events which were warm, but not as warm as now, interspersed with Heinrich events which were far colder than the general cold conditions of the ice age. In other words the ice ages were on average far colder than now but there were wild swings from warmer DO events to bitter cold H events. So, the evidence points to prolonged periods of cold weather with somewhat more ice than today, to intense cold, with rapid ice advance interspersed on and off with warmer weather. The ice age story is very complicated. Here in the west there is lots of being done on how much of ice age time was spent actually being buried in ice. It’s looking like for many tens of thousands of years there was more ice than now, but not miles of it. Then during the last H event western Canada was buried under miles of ice and the Puget Lobe of the ice sheet invaded Washington state – Don Easterbrooke can correct me on this. After the last gasp of cold weather the climate suddenly warmed, and then just as suddenly the Little Dryas arrived to usher in around 2000 years of bitter cold followed by sudden warming into the Holocene where we are today. As sea levels came down during a glaciation, underwater hydrothermal vents would be pouring their heat into an ever shrinking volume of water creating ever warmer seas, perhaps more so in some locations, thus acting as the mechanism for providing the moisture for kilometres of snow. David, I would suggest that you need to “get the hang” of some physics, and more importantly some history of the physical sciences. It is certainly likely that Isaac Newton, was not overly familiar with electro-magnetism or plasma physics, but you better believe that modern astronomers certainly are. It would blow your mind to know just how much astronomers know about electro-magnetism. Virtually all of their experimental observations, are a consequence, of electro-magnetic radiation, over a huge range of frequencies. Gravity and gravitation may be by far the weakest of the four known forces of nature; but only it, and the electromagnetic force are infinite in range. The other two are pretty much confined to atomic or sub atomic regions. But EM and gravity, are fundamentally different, in a most crucial way. So matter (mechanical) naturally tends to coagulate under gravitational attraction, achieving huge total masses (stars). But EM forces tend to blow matter apart, in fact NO arrangement of electric charge, or magnetic poles can push matter together into huge massive structures like stars (or even small ones). No such stable static configuration exists (Earnshaw’s Theorem). so you can’t build a universe on electricity. But welcome aboard anyway. Pull up a chair and grab yourself a beer; we have plenty of room for more folks. We don’t even care much what kind of folks; but we are civilized; so there are some rules. In other words, CO2 is trivial in its thermal effects, not even worth computing, much less trying to use as a control knob.